Scotmid celebrates raising over £260,000 for Maggie's. "The money raised by Scotmid Co-operative is vitally important to Maggie’s, helping us to run our network of cancer support Centres across the UK." 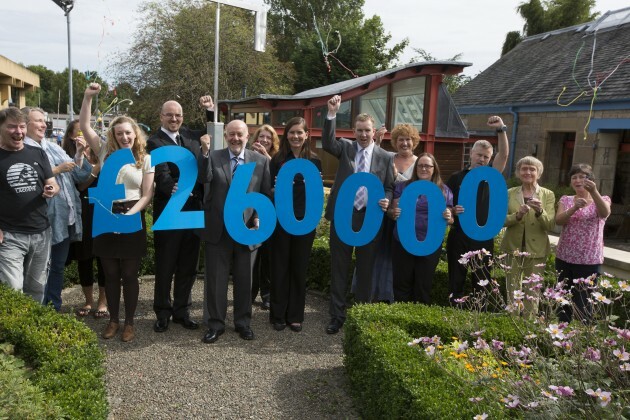 Scotmid Co-operative today (2 September 2013) announced that it has raised over £260,000 for Maggie’s Centres in its charity partnership year. The figure is the most the organisation has ever raised for a charity of the year and is £110,000 over the original fundraising target. Staff and customers across the organisation’s 350 outlets, which includes Scotmid, Semichem, The Fragrance House, funeral branches and post offices, raised the funds after holding sponsored skydives, cycles, abseils, fitness challenges, dress up days, charity nights, car washes, raffles and many other fundraising activities. Scotmid stores also sold 5,000 limited edition charity eco-bags that were exclusively designed by Jack Vettriano and collected donations from customers in-store. The funds will be used by Maggie’s to offer free emotional, practical and social support to people with cancer and their families and friends in its network of centres across the UK. Staff have completed a number of inspiring feats to help Maggie’s, including Linda Marshall from Scotmid Coatshill who shaved her head and Brain McCourt from Semichem in Dunoon who endured a sponsored leg waxing. Staff have also skied the height of Mt Everest at SnowZone in Braehead, bungee jumped from the River Garry Bridge in Killiecrankie and abseiled down the Dundee University water tower. Fifteen people from Scotmid completed the gruelling Maggie’s Monster Bike and Hike in May, while seven staff cycled 960 miles from Land’s End to John O’Groats in September 2012. Pictured above are Maggie’s visitors, staff and volunteers celebrating the £260,000 fundraising total with Scotmid Co-operative staff from Scotmid, Semichem, The Fragrance House and Scotmid Funerals. L-R: Gary Bremner – Maggie’s Centre visitor; Rebecca Mackay – Maggie’s Centre visitor; Seonaid Green – Maggie’s Centre staff; Clare Rajan –Membership and Community Officer for Scotmid; Chris Armstrong – Senior Funeral Director at Scotmid Funerals; Malcolm Brown – Head of Corporate Communications for Scotmid; Yvonne McIntosh – Maggie’s Centre staff; Claire Watson –Store Manager of Scotmid Hamilton Place, Edinburgh; John Brodie – Chief Executive of Scotmid Co-operative; Claire Ovens-Murray – Store Manager of The Fragrance House in Livingston; Ewout de Lange – Store Manager of Semichem in Raeburn Place, Edinburgh; Mary Craig – Maggie’s volunteer; Lorna Muir – Maggie’s volunteer.